What is best for human beings in this human life? What does it mean to be a friend, and how are friendships best made and maintained? What are the best things humans can treasure, and how can they most easily secure them? In a strange world full of dangers, what strategies are best for getting through safely, and how was the greatest wisdom in the world won? "The Words of Odin" is a modern rendition of the ancient book Havamal- the words of advice given to human beings from the God of Wisdom himself, long ago. Filled with the ancient wisdom-sayings, proverbs, and stories of the Old Norse people, Havamal is a tried-and-true manual of wise living and cunning strategy for navigating the subtle complexities of human interaction and avoiding dangers of all sorts. Travelers, wanderers, guests, friends, and seekers of the ultimate wisdom within human life can benefit from Odin's perennial cleverness and timeless advice. This annotated edition contains a clear and nuanced rendering of Havamal into English, preserving its original poetic richness, and is followed by many detailed and informative notes regarding the cultural, mythological, and historical background from which the verses of wisdom arise, all to help readers from any background to understand the beauty and depth of the text. It also contains the text of Havamal in Old Norse. It is also beautifully illustrated by Jesseca Trainham, one of the greatest living Heathen artists and illustrators. A Scottish witch torments the dead for the living. A deathless evil born of traffic with the Devil stalks a lonely forest for generations. A Colonial American cult persists into the modern day, its corrupted members being among the not-so-dearly departed. The Mother of Werewolves is remembered in the dreaming hills and hollows of a distant land. A man obsessed with a woman of the Otherworld rushes to his own certain doom. A warrior stalks a powerful and savage Troll that none can kill, to save his family. Revenge comes from beyond the grave when a sorcerer delivers a magic potion that can restore memories of lives long ended to those alive today. These stories and many more are found within this collection of terrifying and disturbing short tales by Robin Artisson, somewhat notable and semi-well known writer of occult fiction and non-fiction regarding folklore, witchcraft, and spiritual ecology. Haunted wells, haunted mirrors, flying witches, and delirious visions proliferate in the pages of Soon Comes Walpurgis. With 40 Illustrations by Larry Phillips. A down-on-his-luck writer looking for inspiration decides to spend a night alone and under the influence of hallucinogens in the ruins of a house that was rumored to have been built by a powerful family of witches long ago. What he experiences that night changes his life forever... and not necessarily for the best. Over a century before that, in the last years of the Victorian Era, two young girls discover a book in the same house that might well have been written by the Devil- and it conjures forth unspeakable terrors and wonders that carry them both to the strange place beyond life and death. "The House that Cerrith Built" contains the short story "Meadowsweet's Red Chaplet" and the prequel novella to that story, "Yet Thy Spirit Shall Not Sleep." Drawing upon deep strands of folklore, mythology, history, and esotericism, it weaves together two related tales of horror and mystery that ask disturbing questions about the ordinary definition of reality, and the nature of good and evil. Cosmos, History, Post-Mortem Transformation Mysteries and the Dark Spiritual Ecology of Witchcraft. "The Secret History" concerns the deepest matters of all: cosmology and the story of life's emergence and meaning, told from the perspective of a primordial way of seeing and comprehending nature that existed long before civilization began. 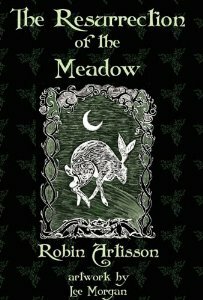 Robin Artisson brings together folklore, mythology, animistic perspectives, and dark spiritual ecology to rebirth a vision of who we are, where we came from, and what might happen to us ultimately, along with spiritual insights into the devastating cost of the excesses of civilization. This book also examines the nature of the ancient Mysteries, experiential pathways that were established in pre-Christian times and which allowed for humans beings- themselves originally entities from the Underworld- to encounter the beings native to their original condition and reestablish relationships of familiarity with them, for the purpose of rediscovering a deeper sense of peace and place in our world. Two methods of establishing new relationships with those same powers are detailed, methods that aim at transforming a person's life and destiny beyond the grave. "Hands of Fate" is the first of the "Small Tome" offerings from Black Malkin Press, each of them covering a single topic of deep spiritual or occult significance. In Hands of Fate, the topic of cartomantic divination with standard playing cards is covered. Author and professional diviner Robin Artisson offers instruction in a deeply detailed and intuitive system of playing card divination draped in the older aesthetic of Traditional Witchcraft and Fayerieism, allowing diviners to channel entire stories of divinatory insight from oracular sources. He discusses methods which will allow any person, whether practicing sorcerer or not, to gain true oracular communication with extraordinary sources of insight. Alongside this central theme of the work, many smaller systems of cartomancy and cartomantic divination devices are described, which can be integrated by a card reader all by themselves, or blended with others. Divination with playing cards is the oldest kind of cartomancy known to man, and this work restores it to an accessible place of dignity and seriousness which can be utilized by all. Discerning readers will discover many treasures of occult wisdom hidden in the underlying metaphysics of the system described within this small but detailed work. IN THIS latest work, witch, metaphysician, and traditionalist Robin Artisson presents an in-depth and darksome interior vision of many dimensions of the old and nearly forgotten Art of true Witchcraft. "Letters from the Devil's Forest" is a lengthy anthology of Artisson's writings regarding every topic of essence and interest to the student or researcher of the half-remembered occult practices of "spirit-pacting" and spirit-allegiance: the timeless root-practices that underlie the genuine sorcerous traditions of the West. Over 130 chapters, representing public and private writings done by Artisson in the last five years, but drawing on over 20 years of his own practice and in-depth researches, are brought together into one informative tome, to better serve the needs of the modern mystic or malcontent in search of a roadmap to the hidden angles of life's most seductive mystery: the mystery of sorcery, and the parallel mystery of spiritual ecology. This is a book that acts as a 'traveler's guide' to a hidden country within each human being. Primal peoples all over the world embrace the ideas discussed in this work: the animistic worldview, spiritual communion with the dead and the Unseen World, sorcery and magic. Author and traditional witch Robin Artisson explores these mystical themes from the perspective of The Old Faiths and pre-Christian metaphysical impulses of Europe and the British Isles. Bringing a new perspective to these ancient practices and making them more accessible, this book is a key to the door that leads into the mythical dimension of each person, and every feature of the sacred landscape. It helps to unlock the hidden wisdom in folklore, shed light on the enigma of the human being, and manifest an experience of the wisdom of the Old Ways- insofar as a book can. This book is about getting out of books and back into the spiritual dimension of the Land itself, and requires considerable dedication and work. Available now from Pendraig Publishing. The Horn of Evenwood, Also called "The Master's Book of Conjury" or "The Witchfather's Bloodless Bones", is a true book of Art, a Grimoire of sorcerous operations, charms, and devices of Witchery. Based on well-worn patterns and operations of Traditional sorcery and European Witchcraft from the 16th-19th centuries, this manual of magical arts provides a complete working system of Craft-sorcery which taps into the numina of the British Isles folk-tradition, the Luciferian mysteries of the Witchmaster, traditional wortcunning, the Rades of Edric and Godda, and the hidden roads to Faery-Elfhame. Included are incantations, conjurations, instructions in the application of the Ten Pillars of Sorcery, "The Service of Sigils" working, and the operations of "Biting the Tongues of Serpents", "Summoning the Witch-Dream by Moth Flight", "Binding the Lovers One to the Other", "The Fruitful Working of the Womb-Seed", and "A Pavis from Foul Imprecations", all of which are intended to instruct an initiate in the use of this timeless arcane system. Available now from Pendraig Publishing. A Grimoire by Robin Artisson, occult writer of note, Hedge-crosser, wortcunning Doctor of Fayerie spirits, and loyalist of the Undying Court and its Queen. "The Resurrection of the Meadow" is described by the author as "A Record of Thirteen Occult Formulas & Charms of Art with Purport & A Sealing Conjuration & their many useful Sorcerous Permutations, Writ & Gathered on Walpurgis Night 2010, For those Inquisitive Adepts who walk The despised path of True Sorcery, The long-dimmed radiance of the Ancient Gold of the Wise." Buy it now from Amazon.com by clicking here.